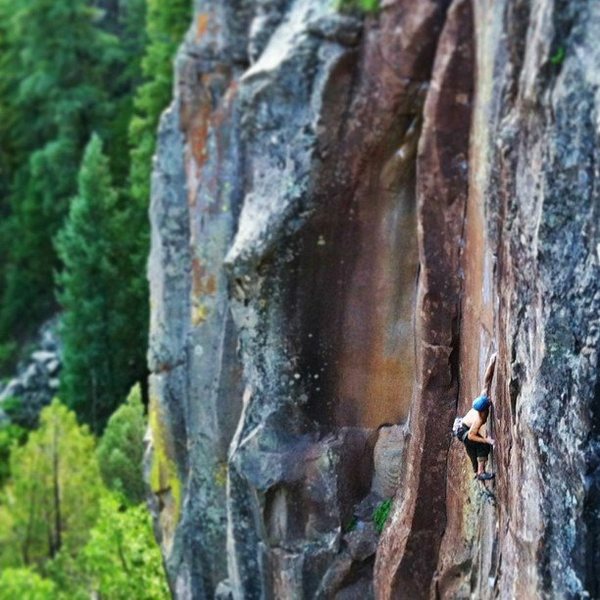 Paradise Forks (AKA The Forks) is a beautiful columnar basalt climbing area located about a half-hour west of Flagstaff. The area is in Sycamore Canyon at a point where the canyon is actually a Y-shaped confluence of drainages. There are two seasonal waterfalls and pools at the ends of the Y, and the point where the Y merges is the popular "Prow" area. The Prow, The Gold Wall, and the Davidson Wall offer the longest routes which are up to about 90'. The stretchy, crimpy crux of Rumbleseat 5.12. One distinguishing characteristic of the area is that almost all routes are approached from above by fixing a line and rapping in. Also, there are exactly zero sport climbs at The Forks and just a handful of bolts (I can only think of 7: two sets of anchors in the choss at the White Wall, and the three on Australians At The Forks). The area really lends itself to trad climbing up beautiful, varied crack systems. Rock is bullet-hard, pro is typically bombproof, and friction varies from polished to grippy. Expect stout ratings. If trees are used for an all day rap line, please pad the tree, and then place a piece of gear near the edge of the cliff to take the full load of the rappel, leaving just enough slack in the line so the tree is never directly loaded. This way you don't have to have a full bombproof trad anchor, just a piece or two and the tree simply offers you an ultimate back up, without being affected. Nestled in a pine forest, the area is quiet, peaceful, and fairly pristine; please try to keep it that way. Many thanks to Larry Coats for providing first ascent information! The Gold pond as seen from near the Prow. This was after a winter of unusually high rain, 2004 I think. Paradise Forks is just southeast of the town of Williams, AZ, just off Interstate 40. There are two approaches--both on good dirt roads. From Flagstaff, drive west on 40 for 27 miles to exit 167 for Garland Prairie Road. Follow this south over some railroad tracks for 8 miles. Turn right onto FS Road 109. Follow this for 3.3 miles to a left-hand turn into the parking lot. From Flagstaff, drive west on 40 for 17 miles to exit 178 for Parks road. Head south over some railroad tracks (road turns into Garland Prairie), and follow this as it makes several 90 degree turns to skirt around a huge parcel of private land. After 13.3 miles, turn left onto FS Road 109. Follow this for 3.3 miles to a left-hand turn into the parking lot. Traffic jam Northern Arizona style. Down Canyon in the winter. Hi all. For those of you who don't know me my name is Will Cobb and I am the Access Fund Regional Coordinator for Northern Arizona. Chris Tatum from Vertical Relief Climbing Gym let me know about an active Turkey Vulture nest situated on the ledge at the top of T.L. Bush earlier this week. With help and feedback from the kind folks of the NACC we felt that a voluntary closure of the Gold Wall was in order. I have since learned that Turkey Vultures are protected under the Migratory Bird Treaty Act and that disturbing the nest is a lawful offense. Local climbers will be checking on the nest frequently from the far side of the canyon in order to minimize disturbance. Once it has been determined that the nest is abandon for the season the closure will be discontinued. "One distinguishing characteristic of the area is that almost all routes are approached from above by fixing a line and rapping in"
For many years, it was very rare to rap in to either canyon. Also for years, all climbs were led ground up. The harder ones often requiring more than a few tries. Nothing was ever rehearsed on TR. This ethic came from Scott Baxter, who was influenced by the Valley ethics of the times. This has the possible advantage of not trashing the tops of climbs since you don't have TRs running all over the place and disturbing the top soil. Times have changed. Most folks want to do more faster. My experience though tells me that I'm much more satisfied with finally getting a difficult ground up lead (which would usually grind me up and spit me out) than something done in a short cutting fashion. I just do not get the same feeling of accomplishment by wiring something out on TR and then leading it. To each their own, until one's actions start affecting others. Paul, are you recommending against TR'ing here? I'm a new climber so I have to TR when I can't find a Trad leader. I'm carefull setting up TR's to not damage trees etc. so I leave the place like I found it. Any feedback on what routes/sections should not be TR'd would be appreciated. That is correct, I am trying to discourage the TRing of many routes due to the nature of the top of the crags and the potential for errosion that this creates. Some climbs are more conducive to the TR (Mayflower sets up easily with very little damage other than to your rope) than others but many are not. As I recall, to set a TR on DD you have to run a line way back to a big jack which means a lot of rope over dirt that is going up and down and back and forth as folks fall off it. That increases errosion. At one point this had become a rather serious problem for that part of the cliff. So much so that the FS got involved and helped fund some maintenance and experimental methods. The original ethic of ground up only is another matter and part of the Games Climbers Play. I preferred that game but that's just me. how do you guys feel about the tr solo set ups? in MY mind, it is the same as rappelling because the rope doesn't move much and it is even possible for some tr solo set-ups to be less of an impact than bringing up a second after leading. With the ground-up ethic (which I have practiced on all but one ascent at the Forks), it still seems to me that there's a lot of erosion because you must set an anchor, top-out, and then rap back down into the canyon. Doesn't seem much different than TR to me. "For many years, it was very rare to rap in to either canyon. The standard way in was to do the silver pond down climb and then walk to the base of the climb." So I guess my question is, after every climb, you would then walk over and do the down climb again, right (and even with that there's at least some erosion)? It seems like this is the heart of the matter: there's plenty of people still climbing ground-up at the Forks, but I'm not aware of anyone who still uses the method that Paul describes. So the impact of modern ground-up climbing seems basically the same as that of top-roping, aside from the fact that top-roping simply makes things more crowded. There's no doubt that you have to top out some time. I think that setting TRs results in more time spent at the top. Here's what I am picturing as an example. 1) A party arrives at the top to set up a TR. The two walk back and forth a couple of times from the trees to the cliff edge to lay the webbing or static line out. Then perhaps they walk back and forth another time to get the anchor equalized, and perhaps one more time to get their rap set up and rap the route. After they finish, they top out and walk back and forth to break it down before moving to the next climb. It seems to me that TR setups require more travel around the top of the cliff. Of course, were the situation such that the terrain on top was all rock and very durable and the bottom more fragile, this might be the best way to go. There's also a route in the overhanging choss section between Davidsons and Sign Wall, bouldery steep and fingers scabbing locks, tried it twice and would guess it to be in the solid .12 range. I would love to hear from some of the old school Jedi about what their favorite route(s) here, and especially why. (1) A low clearance vehicle will do just fine on the more direct road in from Parks Exit. Even in pouring rain the road is excellent and well maintained! If you do decide to go to the next exit and come in, then bear left at the "Y" in Garland Prairie Rd after a few miles. Of course without a true study this is all conjecture but here's my thoughts on why the TR is more destructive on the erosion side. It's not so much the act of setting the anchors and walking around that creates the real problems. It's the anchor itself where the rope runs across the topsoil and is then weighted up and down with falls and dogging. But most anchors on the DD I've seen run a rope for many feet across bare soil and then saw up and down, back and forth as the crew tries to do the climb and that is the culprit. If someone sets a TR, never weights it, then I would have to think your analysis is spot on. The difference between that and a lead belay is just about minimal. Of course, if you're flashing on a TR, sort of begs the question of why ? There are plenty of climbs where TRs at the forks are not much of an issue. Mayflower et.al. can be setup all on nuts off the little shelf or with very little issue from the two trees right there. My understanding is that the area that had the worst problem was up above the Pillow wall. I understand there was an attempt at erosion control project sometime in mid '80s with the USFS. Don't know how succesful it was. I don't get out there much anymore. Last time was spring '11 and I was surprised at overall how well the place looked. But it was March so just coming out of the snow. The silver pond "walk down" was pretty much the standard way in. For the first time or two of the season, when we'd bring others out, etc... we'd drop nuts in the top and hang a line for either a belay or a hand line. Once we had it wired again, it was a simple third class. Pika the wonder dog could do it but he was usually given either a belay or he'd take a long swim (inside joke there). When it was wet, iced, snowed in, etc... we'd do the rap from somewhere. Occasionaly we'd do a late day rap to get to the gold pond without the walk around. Bottom line is that it's a small area and climbing populations have exploded. A few of my fav climbs missing from ryan's list that pop to mind: Waterslip Down, UKD, Acid Test, Black Rose, Negra Prima, the Prow. There was (is) a great fun 5.8, Kon Tiki over to the west of Ivory Snow. I suspect you have to have climbed a lot of stuff to actually like it since I think it was a lichen/moss fest thing but fun moves. I suspect the name is the clue to finding the route. One of the pillars closest to the Silver pond.